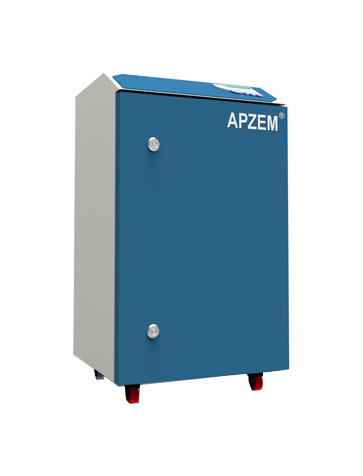 Apzem® Mini Gold series Laser dust and Fume Extractors are specially designed extractors catering the need for compact, portable medium duty fume dust extractors for Jewelry processing industries. All our gold series extractors were designed specially to extract and recover the precious metals like Gold, silver and Platinum dusts that is generated while Hallmarking, Engraving, cutting and other processed involved in jewelry manufacturing giving greater return on Investments to jewelry manufacturers. All our gold series extractors were build with high quality steel with powder coated exterior finish, easy to recover filter modules that are specially designed to maximize filtration of even ultrafine precious metal dust particles and minimizing efforts to recover the metals. Build with high pressure extraction module, filter choking alarm indicator capable of extraction and recovery of very ultrafine gold dust particles. Our mini Gold Extractors are specially made catering the needs of jewelry Laser marking, Hallmarking, Engraving, Jewelry spot welding, Laser cutting applications. Contact us at 7401373819 or send enquiry to sales@apzem.com to understand more about the products, features, and recovering of gold dusts . Gold, Silver and Platinum processing. Flow :0 to 250 CFM. Filtration : Three stages disposable filters.